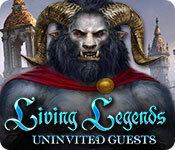 In Living Legends: Uninvited Guests, an air of mystery begins to unfold before you even get to take the transport to the castle. You begin to suspect that some monkey business is going on. Clues lead you to believe that danger lurks close by. Guests are disappearing and the castle is wrought with peril. You run across a character wielding a crossbow and he fills you in on what’s going on: There’s a monster in the castle and he’s holding everyone hostage. You feel like saying, “So…there’s not going to be a wedding…?” but you decide that the hunter with eyes ablaze probably wouldn’t appreciate it. So you decide to assist him and figure out how to defeat the beast and get the castle and hostages back. And by the way, where is your cousin? 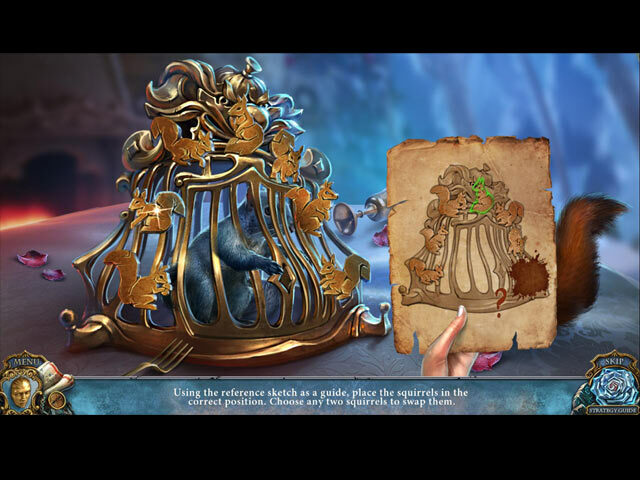 The graphics in Living Legends: Uninvited Guests are lovely. A majestic castle is set upon a mountaintop while a waterfall cascades down the side into a river. Details like glowing eyes, mist, and smoke all add to the wonderful effects. It’s these minute details that pull you in – the scars on the face of the hunter, etching in the leather arm bands, grooves in the horns of the beast, and more. Each scene is filled with rich colors, either muted or bright, depending on the lighting. Although this seems to be a little darker and the tale is spun differently, it still feels like you’ve stepped into a mythological story – and you are the heroine that needs to save the day before it’s too late. Dramatic music – somewhat similar to the “Mission Impossible” theme plays softly in the background. While soothing, it also has that beat that lets you know you really need to keep moving. 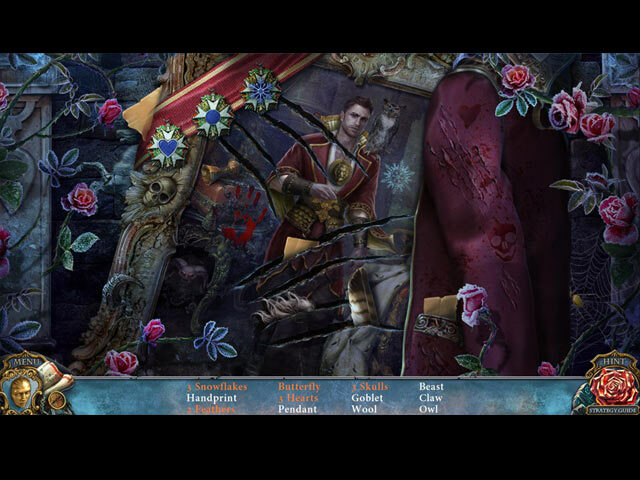 There are plenty of hidden objects in Living Legends: Uninvited Guests, and a whole lot to find and redeposit before you can even step foot in the castle. That’s OK – you get to step inside a mysterious tent and meet one of the characters anyway. You’ll need some help – along with a talking mirror – to make your way to face the dangerous castle, fantastical creatures, and mysterious beast that’s behind it all. There’s also a few cute squirrels on your side, there to help you out. Things are ready to stop you, so those hidden objects are important to find to perhaps open a door or arm yourself. Different creatures roam about and sometimes things animate – so watch out! Find a morphing object in each scene – it’s easy to forget with all that’s going on. You’ll also need to collect owls as part of your mission – each time you happen upon a new scene, the indicator to the left of the screen will let you know how many are there. 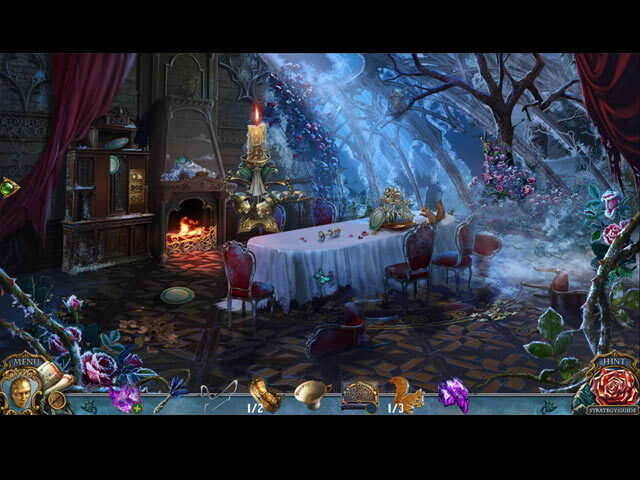 Living Legends: Uninvited Guests is a great hidden objects game filled with mystery. It’s a beautifully crafted game with gorgeous settings and detail. Get lost in this fairytale by becoming the hero and saving the day!